An overhaul of a long-decaying stretch of the Brooklyn-Queens Expressway has been described as “hell,” “miserable,” and the “most challenging project not only in New York City but arguably in the United States”—and that’s just according to the commissioner of the city’s Department of Transportation. 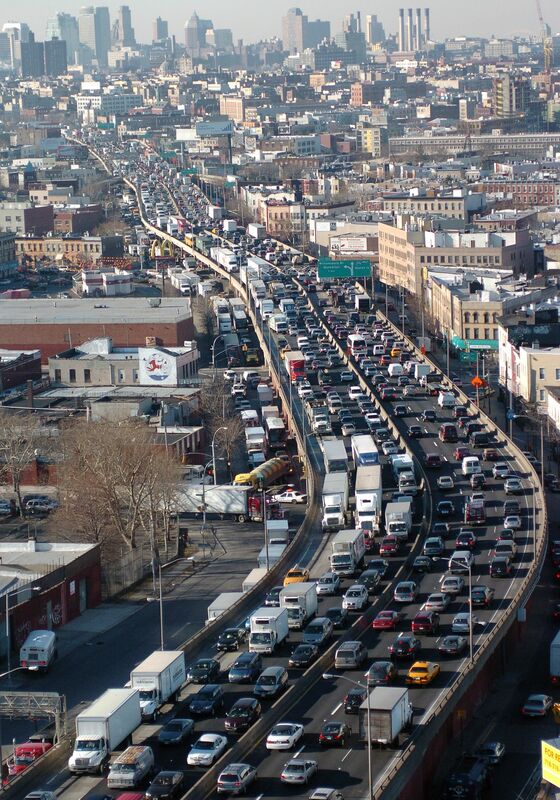 Built in the 1950s by storied city planner Robert Moses, the BQE carries some 153,000 vehicles per day. Now, 65 years later, a 1.5-mile span of the highway between Atlantic Avenue and Sands Street is crumbling, and city and state officials are mulling ways to repair the roadway. Complicating matters is the fact that the Brooklyn Heights Promenade is perched atop the BQE’s triple-cantilever section. 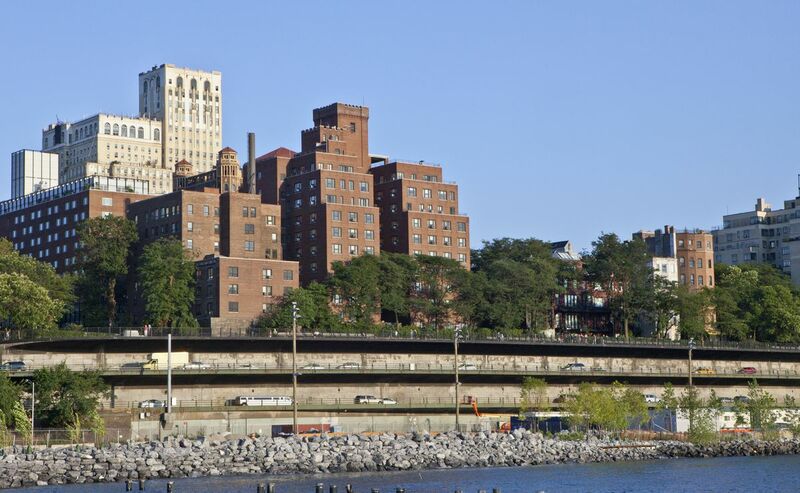 The 1,825-foot esplanade, with sweeping views of Manhattan and the East River, is structurally connected to the roadway, so any changes that happen to the BQE inevitably extend to the promenade, which has become a sort of communal backyard for Brooklyn Heights. That’s why the promenade’s proposed destruction—albeit temporary—in renovation plans put forth by the DOT have caused such agita. An online petition created by A Better Way, which launched in response to the city’s tear-down-and-rebuild proposals, asks the DOT to go back to the drawing board; to date, it’s garnered 70,000 signatures. The chorus of community, preservationist, and urban planners’ concerns has coalesced in the form of an alternative proposal put forward by the Brooklyn Heights Association, a prominent voice in the neighborhood, and a bold plan put forward by Comptroller Scott Stringer’s office, who suggested converting part of the triple cantilever into a truck-only road with the middle level transformed into a High Line-esque linear park. Now, the DOT is in the midst of exploring other options to renovate the BQE—including the BHA’s and Stringer’s plans—and asks that New Yorkers bear with the city as it undergoes “significant engineering analysis” to determine other alternatives, the transit agency said in a statement. But what are some of the other options? Read on. If nothing is done to reconstruct the triple cantilever the city says it will have to issue weight restrictions and reroute trucks—some 25,000 use the expressway per day—from the road by 2026, and close it by 2036. This would force the expressway into emergency repairs while ushering in nightmarish commutes for drivers. To stave off that dystopian future, the DOT has put forward two potential proposals to renovate the BQE: a temporarily elevated roadway or an incremental, lane-by-lane approach. The elevated highway—what the city refers to as the innovative approach—would dismantle the Brooklyn Heights Promenade and build a new road in its place for at least three years, with promenade access disrupted for six years, while contractors rebuild the structure below. To clear the way for cars, the city would need to get rid of the esplanade, install a new foundation and columns along Furman Street, and lay down fresh road—just that leg of the process could take a year and a half. A rendering of the city’s temporary elevated highway, or innovative, option. Further north, the Columbia Heights Bridge would need to be taken apart—bridge traffic would be rerouted through Willow Street toward Old Fulton Street—so the elevated road could continue. (It would run over part of the the Brooklyn Bridge.) Once work is complete, traffic would be rerouted to the new BQE with wider lanes and added shoulders for emergency vehicles—something the current highway lacks—and build a new promenade 35 feet wider than its predecessor. The process would take some six years when all is said and done and cost up to $3.6 billion, the DOT estimates. Transit officials have said they favor this approach because they could pack in the most work in what they say is the most compact timeline. It would also allow crews to build new direct connections to the Brooklyn and Manhattan bridges without added closure time. Improvements to neighboring parks and pedestrian and bike connections are also possible. Drivers would ultimately see fewer delays with this method and less traffic would need to be diverted onto local roads compared to the city’s alternate plan. What a renovated, widened Brooklyn Heights Promenade could look like. 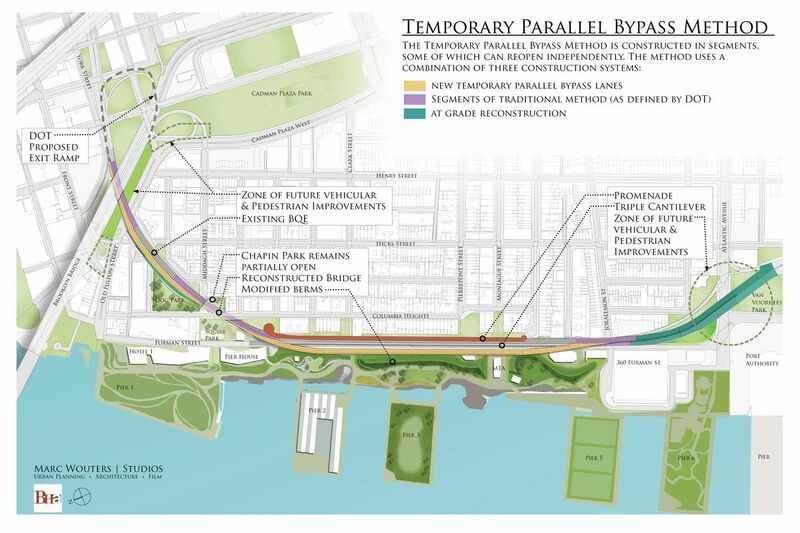 Alternatively, workers could refurbish the BQE lane-by-lane and divert traffic around construction in what the city has dubbed the traditional approach. Work could last more than eight years using this method and require a whopping 24 full weekend closures. (The elevated highway option would require two full weekend closures.) An upside to this plan is that the promenade would only close for up to two years, but the perk of rebuilding a wider walkway would disappear. Costs would also rise, going up to as much as $4 billion. The city would still be able to make safety improvements, but new connections to the Brooklyn and Manhattan bridges would not be possible. Both proposals have their pros and cons, and both have garnered fierce opposition. Health experts have raised concerns about air pollution from erecting a highway practically on Brooklyn Heights residents’ doorstep. Preservationists, who say the project may violate decades-old laws that protect the promenade, have threatened legal action if the city moves forward. Homes and backyards run adjacent to the promenade and will have the years-long construction project on their doorstep. In November, the BHA presented a plan developed by Heights-based architecture and urban planning firm Marc Wouters Studios, known as the temporary parallel bypass method. The approach would erect a freestanding, two-tiered temporary highway a few feet west of the existing triple cantilever. A rendering of the temporary parallel bypass method. Marc Wouters Studios and Nightnurse images inc. Instead of replacing the promenade with a temporary road, one stretch would run beside the expressway, enabling the promenade—and local businesses that depend on the foot traffic it attracts—to remain open during the majority of construction. The temporary bypass would run on land currently devoted to parking lots and Brooklyn Bridge Park’s berms, but Wouters says it would not encroach on usable parkland. He believes it could even create improved pedestrian crossings on Joralemon Street, and other locations, and a potential visitor parking area for the park. Further north, a second temporary bypass would be constructed along the stretch between Columbia Heights and the Brooklyn Bridge. (It’s worth noting that this plan would not run over the Brooklyn Bridge, unlike the city’s proposals.) 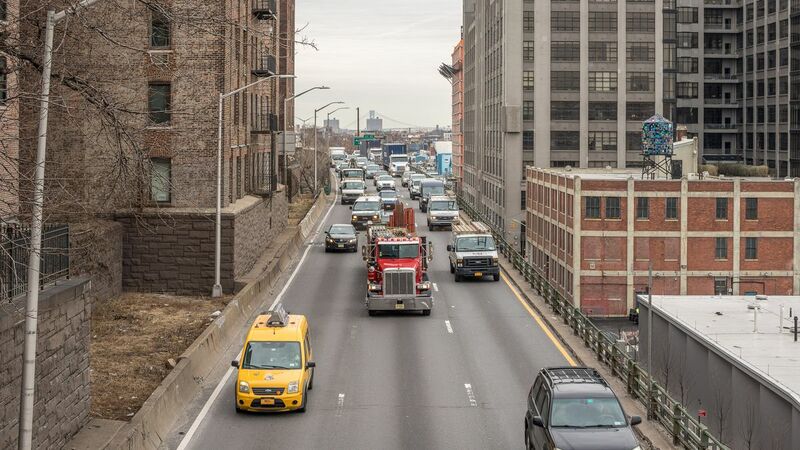 The lane-by-lane approach—used in the city’s traditional method—would be implemented for certain parts of BQE repairs, such as for connections between the interstate and the temporary bypasses. The temporary parallel bypass plan. At the moment, there is no cost estimate or schedule for the plan, but Wouters believes the proposal has a comparable price tag and timeline to the city’s options. But even if the city doesn’t go the parallel bypass route, Wouters says collaborating with the city on out-of-the-box thinking to limit the impact on locals is crucial. BHA and A Better Way will host a BQE town hall April 3 at Plymouth Church (57 Orange Street) at 7 p.m.
What about tearing the BQE down? It’s not an untested concept, either. San Francisco razed the much-reviled Embarcadero Freeway and replaced it with a boulevard in 2002. The result was a triumph for the Downtown area with miles of new public space, bike paths, and transit routes where the two-tiered road once stood. The surrounding streets were able to efficiently absorb traffic while the mass transit system, Bay Area Rapid Transit (BART), experienced an annual 15 percent increase, according to The Congress For New Urbanism. A traffic jam on the BQE. New York City made a similar move when it replaced what was once the Miller Elevated Highway with the West Side Highway in 2002, after the road gave way under the weight of a cement truck. Over the years, the city has added parkland, open space, and bike and jogging paths along the road. But the BQE is a crucial viaduct for the city’s manufacturing and industrial sectors, and the DOT maintains that removing it would present its own set of daunting challenges and implications for the city. Still, others feel transit officials should take a bolder approach and reconsider an expressway that contributes to the 30 percent of NYC’s greenhouse gas emissions generated by transportation. Frank says the BQE also represents a “depressed pocket of real estate.” He was curious how much land could be freed by eliminating even part of the expressway, and examined the mostly elevated stretch that runs from 65th Street in Sunset Park to the Kosciuszko Bridge, where he looked at the street frontage running on either side of the highway. The triple-cantilver section of the BQE. Not all of that space would be available for development if the BQE were to be torn down, but even accounting for obvious restrictions—schools, landmarked areas, and so on—there would be 12 miles of buildable land running on either side. If that land was up-zoned, for instance, at a depth of 200 feet, that’d equate to freeing up some 290 acres of land. Depending on zoning, that could be put toward the creation of hundreds of thousands of units of housing, Frank estimates. “You could add housing, it could be mixed-use commercial, a lot could be done with that,” he said. If the BQE was torn down, a phenomenon known as induced demand—essentially, the more highway lanes you build, the more traffic you create—would disperse traffic into city streets, commuters would find alternative routes, and some drivers would be siphoned from the roads altogether, said Frank. The opposite effect would take place if traffic lanes are reduced, and Frank points to Seattle’s Alaskan Way Viaduct as evidence, where the 90,000 cars that used the now-closed road each day seemingly ”disappeared” after it shuttered in January. 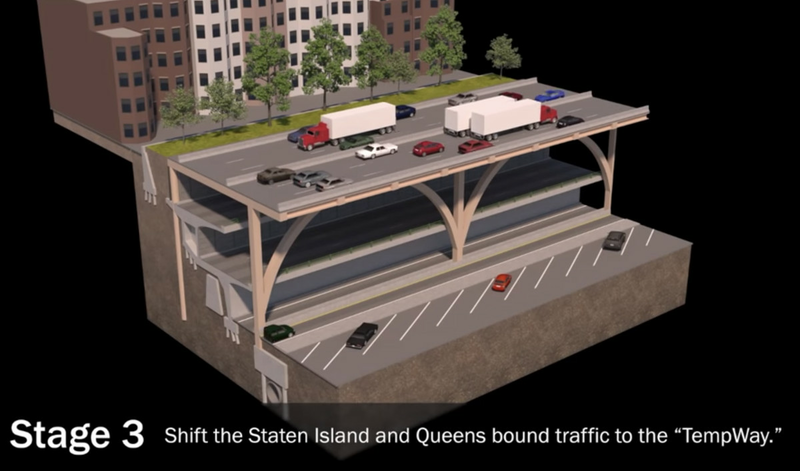 Comptroller Scott Stringer, who has vocally opposed the city’s plans, has unveiled a “middle-ground” plan that presents a dramatic reimagining of part of the BQE while maintaining the expressway. Stringer says while tearing down the BQE is an enticing thought, it’s not practical because of the sheer volume of trucks that roll through the corridor each day. 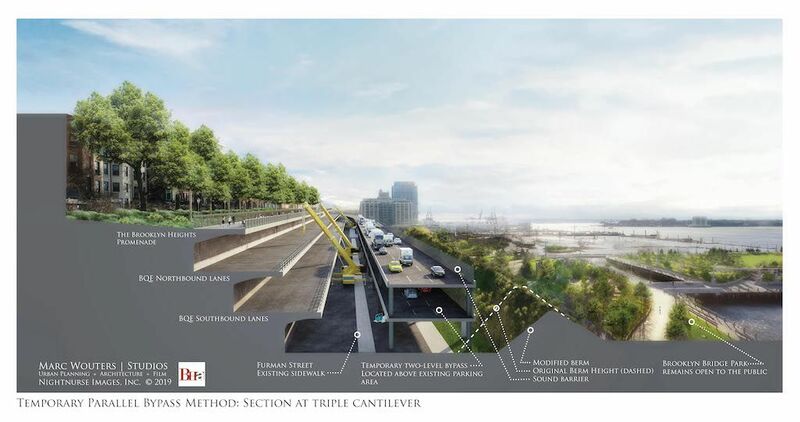 Under his plan, DOT would reconstruct the bottom-level of the triple cantilever while traffic continued to operate on the middle tier—this would negate the need for a temporary roadway such as those in the city’s innovative plan and the BHA’s proposal. 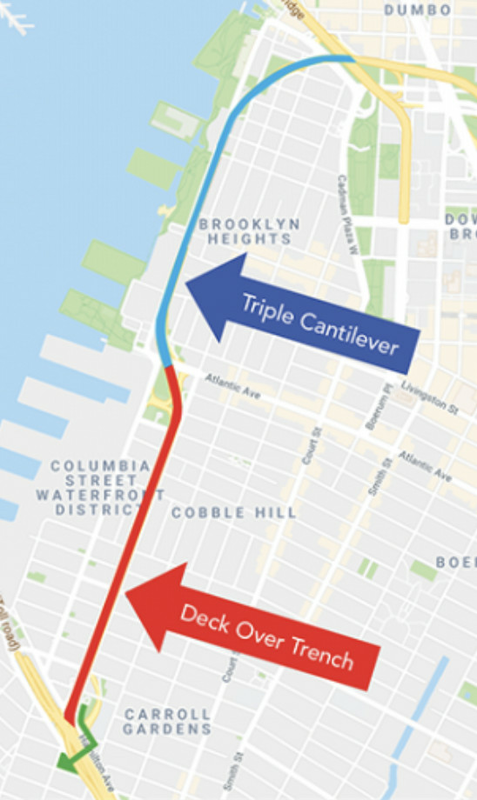 Once reconstruction on the lowest level is complete, truck traffic (and express buses) would be permanently moved to that level; and instead of three lanes, Stringer’s office says the road could be scaled down to two because trucks are only nine percent of traffic on this stretch of the BQE. Stringer says the savings from reconstructing just one level of the cantilever could be put toward building new parkland on the middle section—sort of like the High Line—that would extend south to a new deck of public greenery over the Cobble Hill trench. 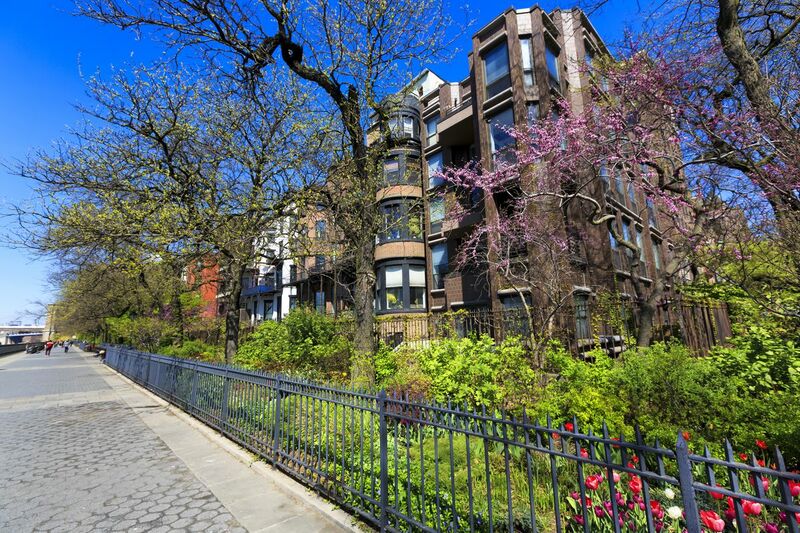 That park space could include a variety of amenities such as playgrounds, dog parks, ball fields, and bike lanes, all of this while keeping the existing street-level traffic lanes and parking in Cobble Hill. When all is said and done, the plan would create miles of green space that would start under the Brooklyn Bridge in DUMBO and stretch south to Hamilton Avenue on the edge of Carroll Gardens and Red Hook. Keeping induced demand in mind, traffic would be diverted to other routes and project funds would also be put toward beefing up local subway and bus infrastructure. The promenade would largely be untouched by this plan. “We remain hopeful that the agency can view the BQE’s deterioration not just as an engineering challenge, but as an opportunity to create something new and bold that both accommodates essential traffic and enhances surrounding neighborhoods,” Stringer wrote in a March letter to Trottenberg. At the moment, Stringer’s office doesn’t have a cost estimate or an expected timeline for the project. DOT says it is exploring the proposal. Aside from being cost prohibitive, tunnels come with a slew of logistical challenges, according to the city. In 2016, DOT conducted a feasibility study that looked closely at six possible tunnel configurations. The survey explored the myriad issues such an undertaking would raise, chief among them navigating the extensive web of existing infrastructure beneath Downtown Brooklyn, including subway lines and massive water pipes. Of the proposed tunnels, city officials say only one would be workable: a roughly three-mile shaft starting around 21st Street on Third Avenue and ending near Kent Avenue in Williamsburg. It would essentially serve as a bypass, shooting vehicles past Downtown Brooklyn between South Slope and Williamsburg, with no direct links to the Brooklyn or Manhattan bridges, or any of the local connections for the neighborhoods above the tunnel. “Those connection points are about 50 percent of the traffic on the BQE currently, so even if we were able to build a tunnel, 50 percent of the traffic needs to go somewhere else,” Tanvi Pandya, the DOT project manager for the BQE reconstruction, cautioned during September’s DOT presentation on the project. A diagram of a possible BQE tunnel. 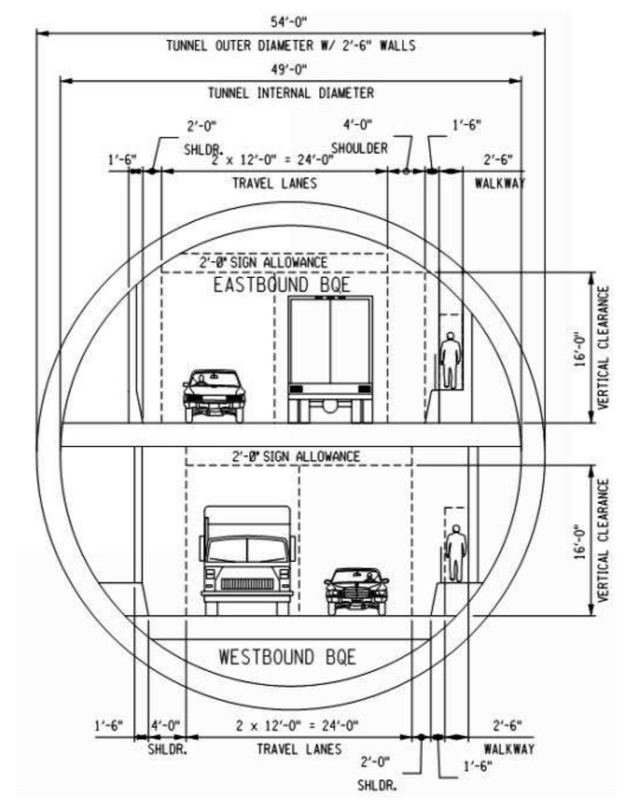 Under this model, a tolled version of the triple cantilever structure would be maintained to keep those connections, so a tunnel would only be a component of a potential fix—and with an estimated price tag of $8.6 billion, according to the city’s 2016 study, the city doesn’t see a tunnel as a tenable option, said Pandya. It’s not impossible, but unlikely, explained Horodniceanu, who in addition to his tenure at the MTA served as the traffic commissioner with the city’s DOT from 1986 to 1990. Horodniceanu noted that current tunnel boring technology can create tubes with a diameter up to 54 feet, which can only accommodate two lanes of traffic. The BQE, on the other hand, has three lanes in either direction and still backs up with traffic. Emergency exits, among other things, would also need to be included in the design. To do that, the city would need access to private property along the route—likely exerting eminent domain to acquire those properties.